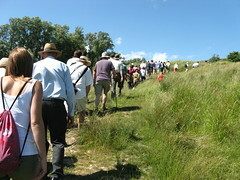 This year’s final RMCP guided walk to the Denge mirrors is on Sunday 11 September 2011 at 14:00. 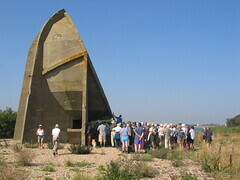 Planned dates for public access to the Denge sound mirrors in 2011 have been announced on the Notice Board section of the Romney Marsh Countryside Project website. There is one open day this year, and two guided walks. These events don’t need to be booked and are free, but rely on donations to cover the costs with at least £2 per person suggested. More information at the RMCP website. Anyone planning to attend these events should obviously confirm details with the RMCP before travelling. Remember, the RMCP events are the only way to visit the Denge mirrors. The walks are very popular, and well worth doing. Another very popular walk, it seems: I stopped estimating at 150 .